1. We were on our way to another restaurant at the harbor when we walked by this fine dining Italian restaurant with views of the marina. While we were looking over the menu, the owner came out, greeted us, and welcomed us inside. We noticed that they have some good happy hour deals and plenty of fine food to please our palates, so we stepped inside. 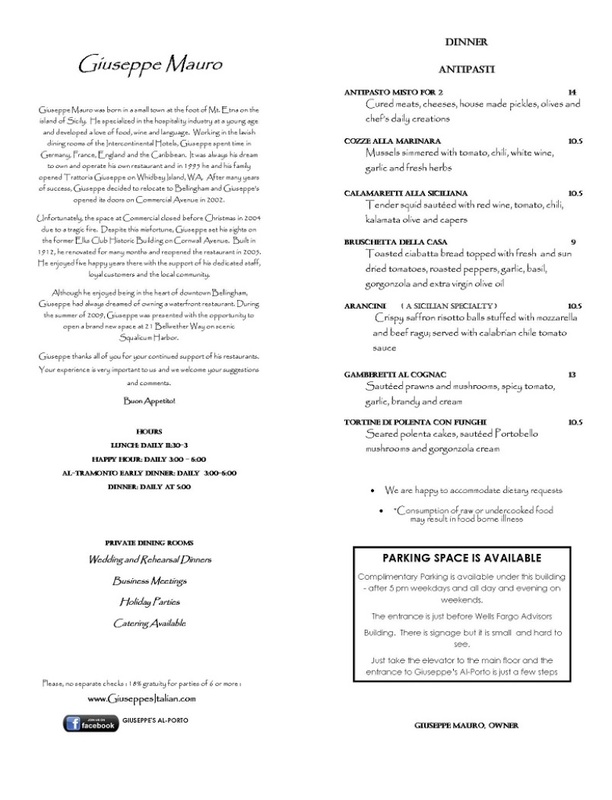 Be sure to request seating in the bar area if you will be ordering from the happy hour menu. We failed to mention this before we were seated. Fortunately, our server allowed us to stay in the restaurant area next to the window with a view of the fountain on the patio and the boats docked at the marina beyond that. We both ordered a 3-course meal for $18 each. 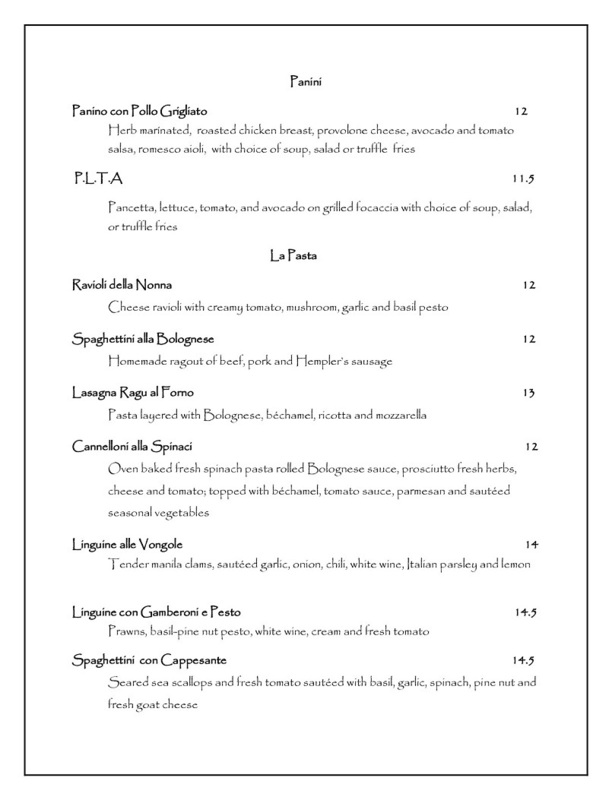 This happy hour fixe prix menu is only offered between 3-6pm. You have a choice of soup or salad for the appetizer, about five different choices for an entrée, and a choice of gelato or mousse for dessert. The service, atmosphere, food presentation and quality, restaurant decor and cleanliness were all top notch. 3. We tried the new Giuseppe's last night! Overlooking the harbor on Bellweather, the new location lacks some of the character of the original downtown restaurant, but boasts simple elegant decor in a classic yacht harbor setting (not to mention, ample parking). 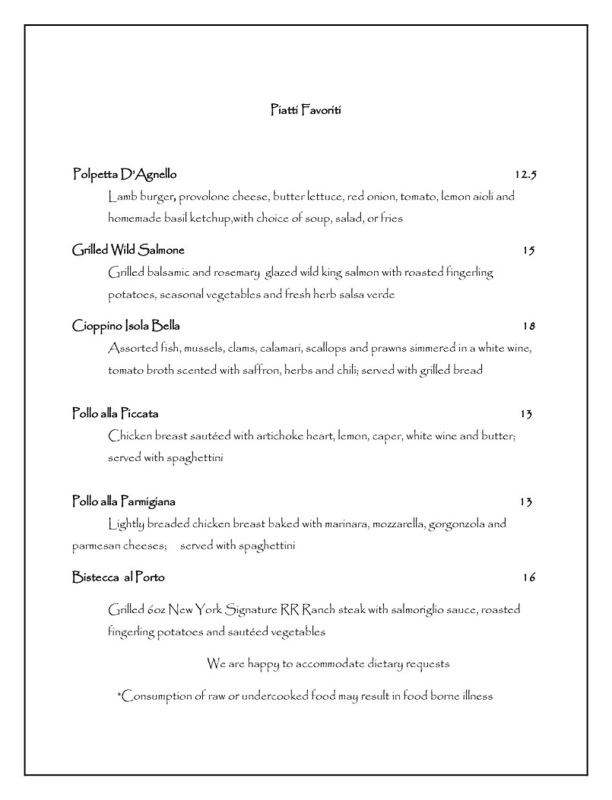 But Giuseppe's is all about great food and outstanding service. The three of us slipped in just before 6 pm and while two of us ordered off the regular dinner menu, our friend Dan enjoyed a fabulous three course ravioli meal on the early bird special for only $16.95! We split a Caesar salad that was crisp, and featured a tasty, albeit, fairly ordinary dressing (Full disclosure: I don't really consider it a Caesar Salad unless it includes anchovies and the dressing is prepared fresh at the table, and toss the salad in your presence with premium anchovies). The food is always wonderful - if you don't know what to have you can't go wrong with the Salmon! 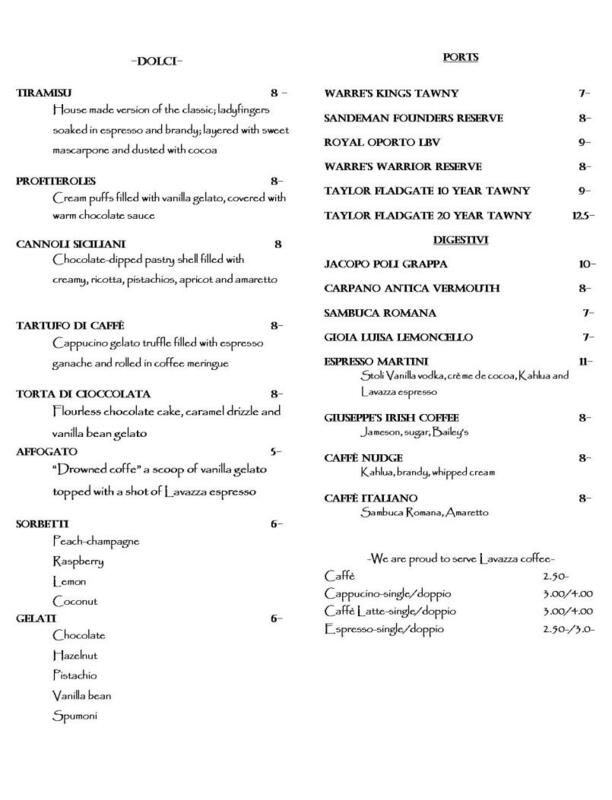 The wine list is large and they will help you find the perfect glass or bottle to match your meal. The service is wonderful - from Giuseppe coming to your table to make sure everything is great to the outstanding servers - ask for Mike if you read this before you are seated! 7. I've eaten at this restaurant 4 times now. Every time we've had amazing food. This place is always packed with locals. The owner can always be seen walking around checking in on the staff and the tables. I've come here with a group of friends and on date nights. Very romantic! 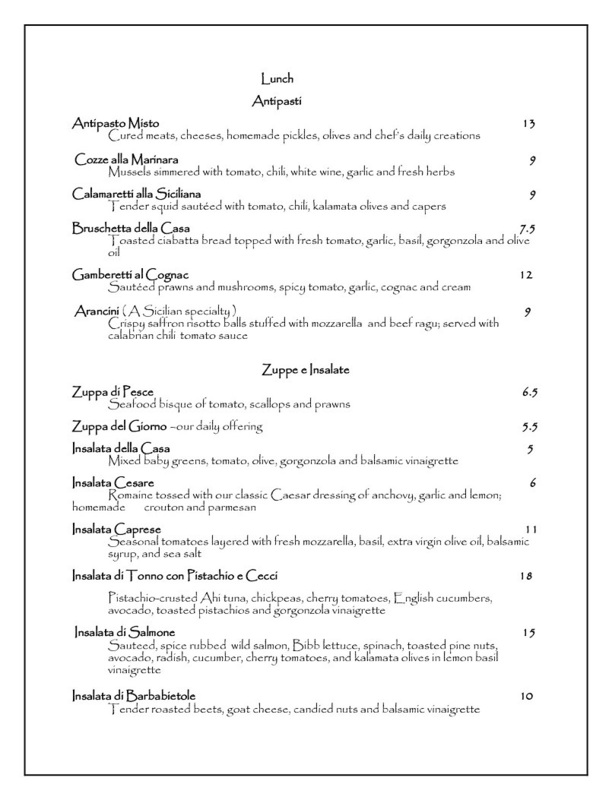 Giuseppe's Al Porto Ristorante Italiano offers fine dining in a magnificent setting, featuring a romantic view of Squalicum Marina on Bellingham Bay. Giuseppe's captures the best of this beautiful waterfront location, and adds the charm and warmth of Italy. Guests are pampered in a way only Giuseppe Mauro and his family can provide. Two large outside dining terraces facing west are softened by a beautifully landscaped lawn, with views of magnificent summer sunsets that add an amazing touch to your dining experience. The Bar… Giuseppe's is host to a Happy Hour 7 days a week, with a bar menu of side dishes from $5 to $7; ample enough to make a meal, and great fun for sharing. Our full bar has a menu of cocktails, liquors, and wines by the glass. Our Patio …. What a great way to enjoy the view. Join us for a drink, dinner, or host a special event on one of our patios. The Wine Room…. 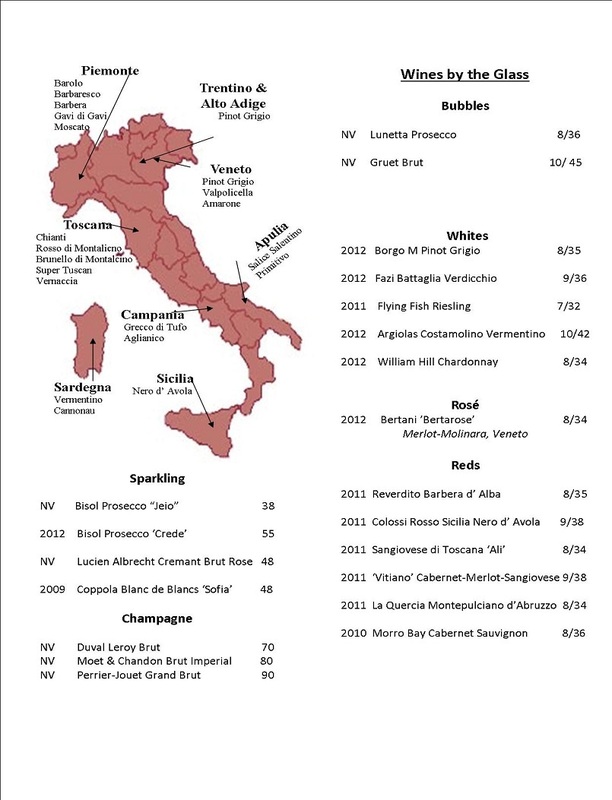 Giuseppe's wine list features a wide regional variety from around the world. The Banquet Rooms…. combined seating up to 70 guests. A privacy curtain creates two smaller banquet rooms that seat 30 guests each. Great for special gatherings of all kinds. Our Main Dining Room…. seats up to 100 guests and has its own private entrance. 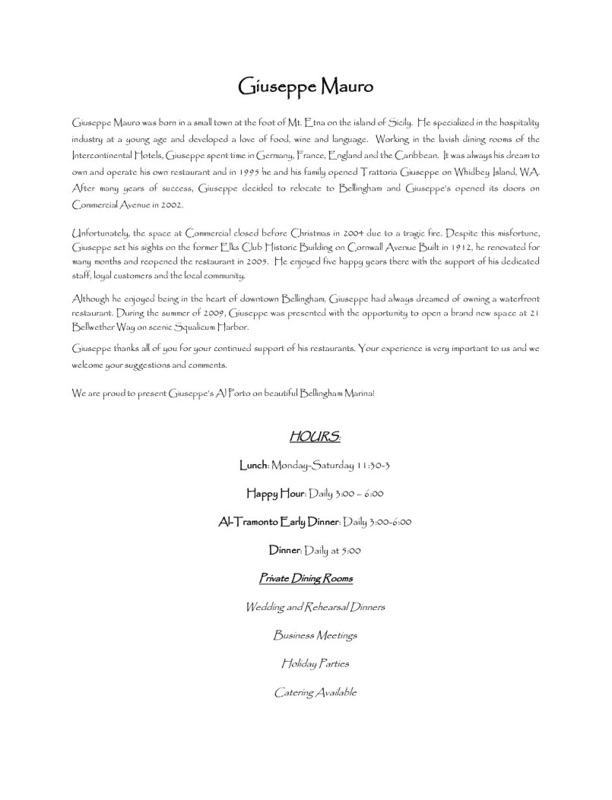 Make Giuseppe’s your first choice for wedding and rehearsal dinners, marriage ceremonies, and/or receptions. Join us for a truly memorable dining experience!